Republican congressman from Wisconsin Paul Ryan reveals the House Republicans' budget proposal, which makes $4 trillion in budget cuts over next 10 years, during a press briefing in the US Capitol in Washington, DC, April 5, 2011. To New York Times columnist David Brooks, Ryan's 73-page budget outline  it's not an actual budget  is "the most comprehensive and courageous budget reform proposal any of us have seen in our lifetimes." Here at Time.com, Joe Klein wrote that it's "without question, an act of political courage," while Fareed Zakaria declared that "Ryan's plan is deeply flawed, but it is courageous." 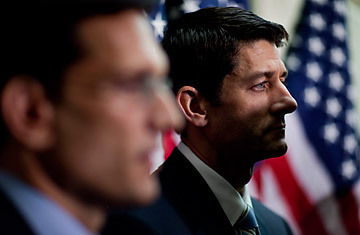 The Economist agreed: "Credit where credit is due; whatever you think of Paul Ryan's budget, it is politically gutsy." This is just weird. Ryan is a conservative Republican committee chairman in a conservative Republican caucus. He was reelected last year with 68% of the vote. Sorry, Joe, but I do question whether it was really courageous for him to propose huge tax cuts for the rich, squeeze health care for the poor, and promise that nobody over 55  the heart of the conservative Republican base  will have to make any sacrifices. Honestly, does anyone think this week has been bad for Ryan's career? It certainly would have been courageous  not Winston Churchill courageous, and certainly not running-into-a-burning-building or fighting-overseas courageous, but at least politically risky  for Ryan to veer off from the Republican party line to embrace tax increases. (GOP Sen. Tom Coburn has earned some bravery points there.) It might have been equally courageous, though less relevant to debt reduction, to revive President George W. Bush's idea of privatizing Social Security, which Ryan supported before it went down in flames in 2005. But there's a reason Social Security is known as the third rail of politics, and this time around, Ryan didn't touch it. One can only imagine the paroxysms of glee that would have erupted in Washington green rooms if he had. My point here is not to shred Ryan's plan, because others have done a good job of that. One critic noted that it makes "magical assumptions about growth," that "it's actually quite weak at outlining reductions in government spending," that the Congressional Budget Office has issued a "devastating critique" of Ryan's "highly unrealistic" proposals to control health costs. Actually, that was Fareed. An even harsher critique titled "Ryan the Fibberoo" accused him of "fudges and elisions, and the odd outright falsehood." That was the same Economist article that praised his guts. I just don't understand what's so brave about fuzzy math in the service of Tea Party ideology. Ryan's plan certainly could become unpopular, but only if people realize what's actually in it. And he certainly isn't bragging about the elements that could alienate the public. For example, his plan would presumably require tax hikes on the middle class in order to achieve its stated goals of keeping revenue levels steady while slashing rates for high earners and corporations. But Ryan doesn't get into those details. To the extent that identifying specific and immediate cuts is politically courageous, House Republicans deserve far more credit for their insistence on slicing $61 billion in spending out of the current budget  at the risk of a government shutdown  than for Ryan's vague pledges about the distant future. I don't blame Ryan for trying to put a positive spin on his plan, rather than acknowledging that it would abolish Medicare and replace it with subsidies that won't keep up with health inflation. People like Medicare. And I can understand why he'd open a budget negotiation with fantasy numbers that depend on 2.8% unemployment in 2021 and "dynamic scoring" that can't pass a laugh test, rather than real numbers that would require much tougher choices. It's smart politics. I just don't understand how it became the political equivalent of the bayonet charge at Fredericksburg. Oh, wait: It did become law. And the Congressional Budget Office has concluded that repealing it would add $230 billion to the deficit. Needless to say, Ryan's budget would repeal it. Courage! Liberal bloggers argue that Ryan gets lionized because he's a Republican. But Joe Klein's no Republican; he's savaged the GOP as a party of nihilists. (He also ridiculed Ryan's plan for "massive political amnesia.") That said, the left has a point when it complains about the Washington consensus that raising taxes on the rich is crass populism and class warfare, while cutting services for the poor is fiscal responsibility and the hallmark of seriousness. There is a tendency in Washington to associate austerity for the masses with "straight talk" and "strong medicine," a yearning for politicians to stop giving their constituents candy and start delivering some long-overdue pain. In fact, Medicare and Medicaid, for all their cost challenges, are not candy. And few of us who are lucky enough to get paid to write about this stuff are in much danger of feeling much pain. Anyway, it's strange to fetishize pain at a time of 9% unemployment; right now, the tepid recovery is by far the most serious problem for the short-term budget outlook. The existential threat to the Treasury in the medium term is the rising cost of health care; in fairness, Ryan has some ideas there, although most of his savings involve giving less health care to people who can't afford it on their own. Obama had some ideas, too, like taxes on high-value "Cadillac" insurance plans, a big push to computerize the medical records system, an independent commission that could rein in Medicare reimbursement policies, and pilot programs designed to reduce the expensive incentives of a fee-for-service system. Republicans dismissed it all as big-government rationing. Even Obama's plan to boost comparative research into what kind of medical treatments work best was attacked as a socialist plot to euthanize the elderly. The original version of this story inaccurately described Paul Ryan's congressional district as "conservative Republican."